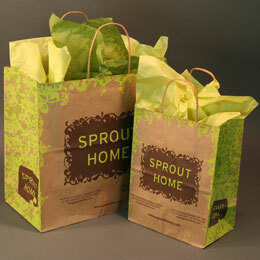 Made from 100% recycled natural kraft paper with at least 95% post consumer recycled content. Minimum order as low as 500 bags per size. Up to 3 color printing available. Click here to learn how you can recieve free plates and free freight on your first order for recycled kraft shopping bags(minimum order 5,000 bags). One side white, the other kraft. But it's all 100% recycled with 86% post consumer content. Your choice whether to print the white or kraft side. Minimum order 5,000 bags per size. Click here to learn how you can recieve free plates and free freight on your first order for recycled Versakraft shopping bags(minimum order 5,000 bags). Our brightest white sheet... made from 100% recycled paper, with 50% post consumer content. Up to four color flexo printing. Bags are recyclable in most community curbside programs. 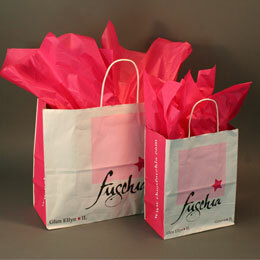 Also available in 20 sizes of merchandise bags. 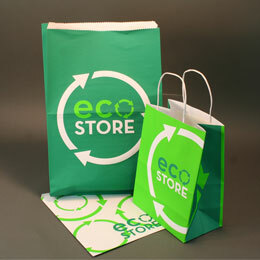 Click here to download our flexo printing and art guidelines for recycled white paper shopping bags.